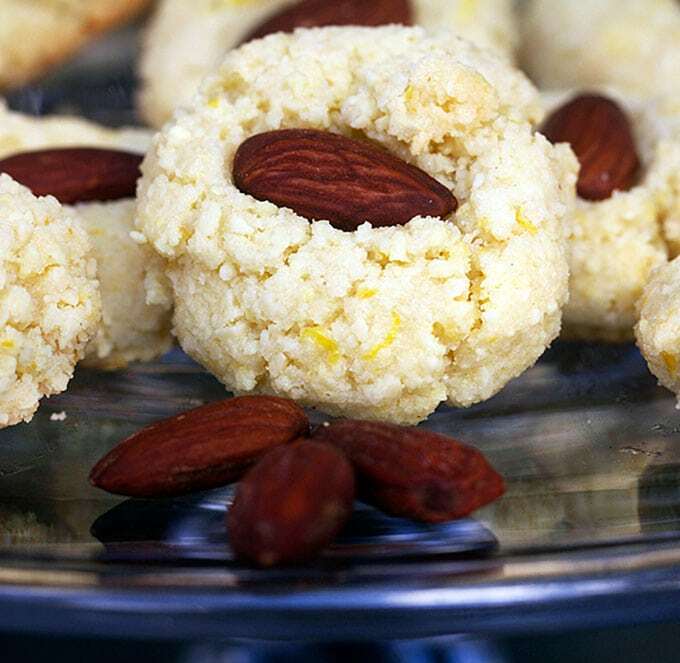 These Flourless Almond Cookies from Spain are almost too good to be true. They’re gluten free, dairy free, and they take just 4 ingredients and 25 minutes to make. And they’re totally delicious.
. The book is filled with healthy and delicious recipes from all around the world – a book after my own heart! As I paged through, these flourless almond cookies caught my eye. I have to admit that the first thing that attracted me to them was how healthy they are. There’s no butter or flour – they’re made mostly from almonds. They bake up crunchy on the outside, soft and chewy on the inside, with a fresh nutty flavor and a hint of lemon. 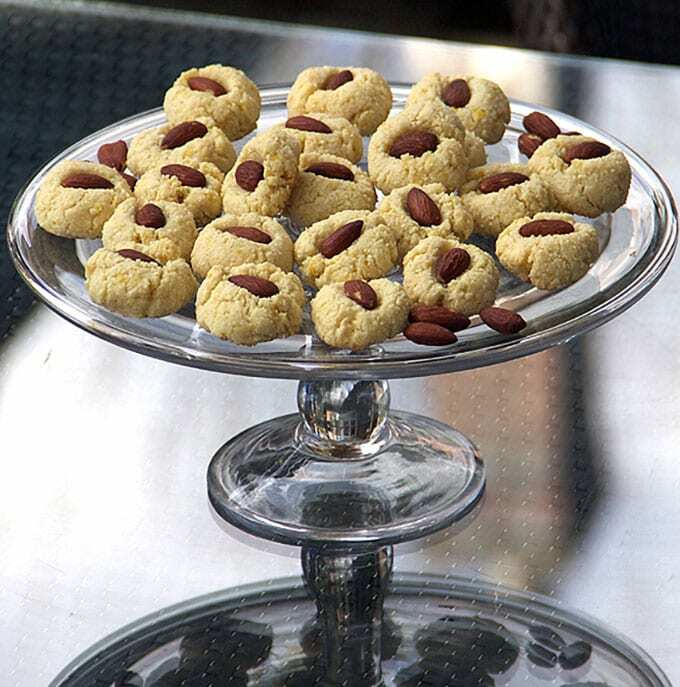 Spain is one of the worlds largest almond producing countries and desserts made with almond flour are common. Almond flour is simply blanched almonds, with the brown skin removed, that are finely ground. Once you grind the almonds for 20 seconds or so, add the egg, sugar, lemon zest and salt, and pulse until you get a sticky dough. 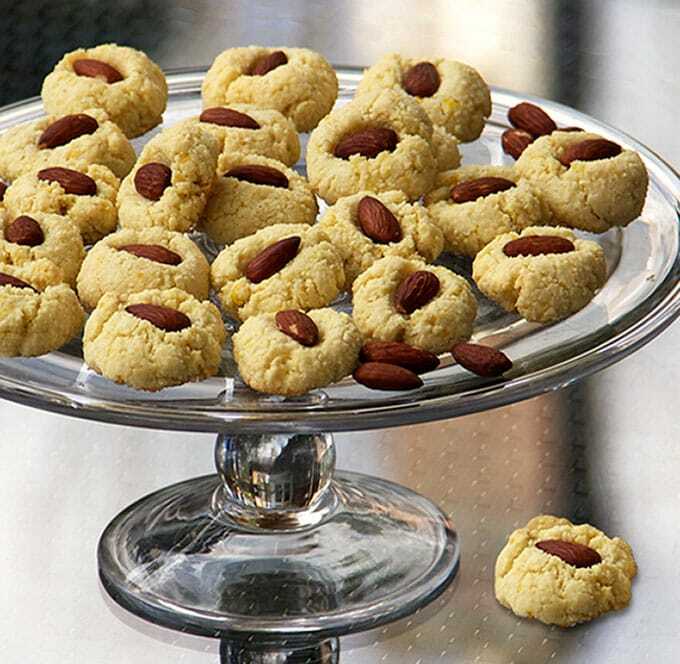 These flourless almond cookies are also great if you happen to be eating gluten free, dairy free, or if you’re looking for a sweet treat for Passover. I hope you enjoy the cookies! For more delicious, lightened-up recipes from around the world, here’s the link to Cooking Light Global Kitchen on Amazon. 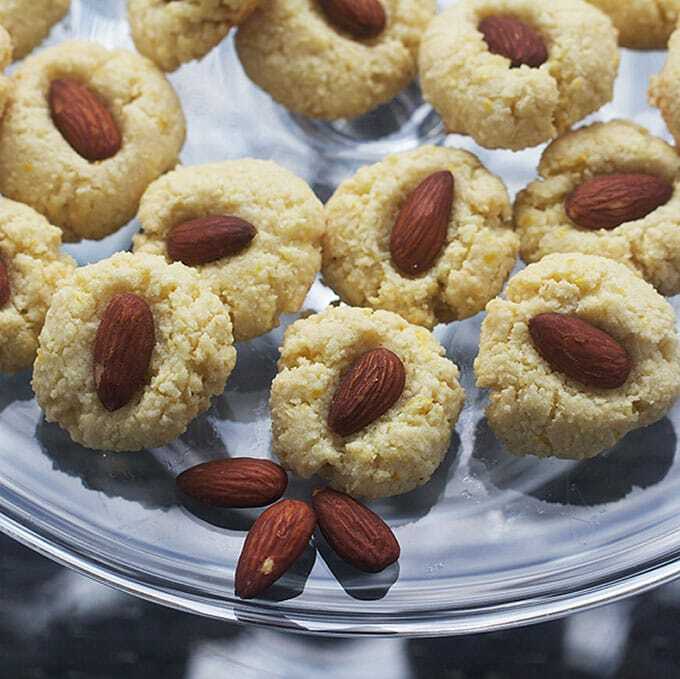 Now here’s the recipe for Flourless Almond Cookies from Spain. If you try this recipe I hope you’ll come back to leave a rating and comment. I’d love to know what you think. Delicious crunchy nutty almond cookies that are made mostly from healthy almonds. Naturally gluten free and dairy free. Preheat oven to 350ºF. Lightly oil a baking sheet. Put almonds in the bowl of a food processor fitted with the chopping blade. Process for 15-20 seconds or until they are finely ground. 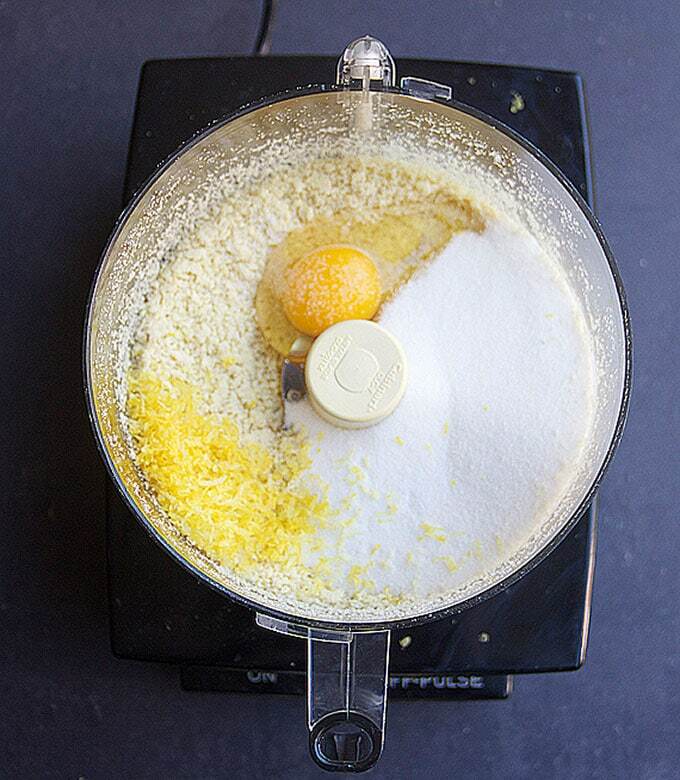 Add the sugar, egg, lemon and salt to the bowl of the food processor and pulse 20-25 times, until the mixture becomes sticky and holds together. Make 24 dough balls. Pull out about a tablespoon of dough at a time. Squeeze it and roll it. Spread balls out evenly on prepared baking sheet. Press a whole roasted almond down into each cookie. Bake in the center of the oven for 16 minutes. Cool cookies on pan for 5 minutes. Transfer cookies to wire rack to cool completely. Store in an airtight container for up to 3 days. On occasion I provide links in my posts to cookbooks or other products, available for purchase on Amazon. If you purchase a product through these links, I receive a small commission that helps support Panning The Globe and is greatly appreciated. Maggie, the recipe calls for 2 cups of slivered almonds, which is 8 ounces. 8 ounces of almond flour is about 2 1/4 cups. My apologies to the poster of the recipe (Lisa) for the so-called humans who have posted the really stupid and self-centred (almost pathologically so) replies about choc-chip and shortbread. Your recipe sounds nice and I am going to try it, using Stevia instead of sugar (diabetic). Thanks Nick. I hope you enjoy! This is an awesome recipe. I’ve tried it with a number of variations–my favorite so far being adding 2 tbs fennel seed. Thanks Ben. I love the idea of the fennel! You saved my day!! After a disastrous lemon cake failure I needed a replacement recipe just hours before a party. I whipped these up in a hurry, using almond meal instead of slivered almonds (it was all I had in the pantry) and they came out just perfectly. I put a dollop of the leftover lemon icing from the ill-fated cake into the middle of the cookie instead of the whole almond, and it worked a treat. Thanks for sharing this simple, delicious cookie. I’ll be bookmarking it for another event! Great recipe, cute little cookies. I am going to put in more lemon rind, and less sugar next time. Thank you very much for your low fat recipe. Thanks for the giveaway… we are on a continuing quest to tweak our oatmeal-coconut-pumpkin cookie recipe. My favorite cookie recipe is a chocolate chip cookie with a secret ingredient: molasses! Yum. I am an old-fashioned Chocolate Chip Cookie gal! My favorite cookies are sugar cookies. I have begun to make them with honey instead of white sugar to be a little healthier. I love shortbread cookies and they are not really healthy and I feel if I am going to eat a treat it should be a good one. I like Oatmeal and Raisin cookies as well as gingersnaps and sugar cookies. I can’t think of a particularly healthy cookie right off …. my fav cookies are snickerdoodles! My favorite cookies are my own recipe for oatmeal cookies with diced dried apricots, dried cranberries and toasted pecans. love my oatmeal cookies, just halve the sugar in recipe. 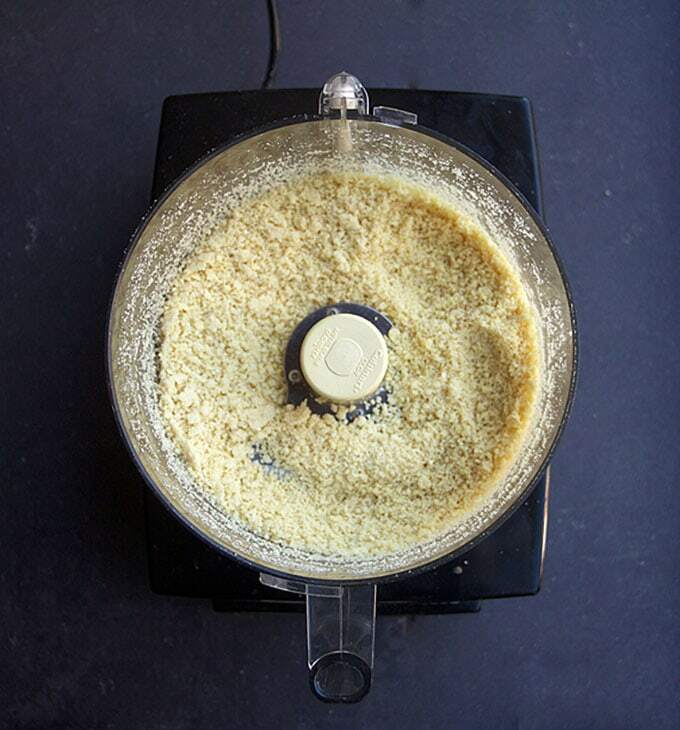 Can you use almond meal instead of grinding up almonds? Yes! Almond meal, almond flour and ground almonds are all the same. Check the ingredients on your bag of almond meal to make sure, but the almond meal I’ve used, such as Bob’s Red Mill, are simply ground almonds. How much almond meal would you use? 1 Cup? I would use 1 3/4 cups almond meal. Thank you that is what I was looking for. Going to start straight away- have lunch with friends, need something nice! Lost my own recipe whilst moving house. I love these cream cheese cookies my mom makes that are filled with cherry preserves and sprinkled with powdered sugar. I love my mom’s chocolate chip cookies!!!! Classic and hard to beat with a glass of ice cold milk! These look wonderful! They sound like just the thing for my son-in-law. They don’t sound too sweet either. I already subscribe to your post via email, and I don’t do tweets, Pinterest, etc. I don’t see how to enter your contest by just commenting. I have made several of your recipes, and can’t wait to try the pain au chocolat. I went to Trader Joe’s to buy the puff pastry and they only carry it during the holidays, so I’ll have to go to another store to get some. Thanks for your intriguing recipes.